The Heart of Healing is a project of two innovative, assemblage sculptures created by Arts for Healing to raise cancer awareness. With a focus on empowerment, the sculptures were created from meaningful objects donated by people whose lives have been affected by cancer. These objects represent specific attitudes, actions, and situations that empowered people to cope while they or loved ones were going through cancer. By presenting these examples, the sculptures spark empowerment-based thinking and dialogue about cancer. The first sculpture, Life's Voyage, has completed a seven-month exhibit tour. The objects it is made from and descriptions of their meaning are presented on the Objects page to inspire and encourage us when facing cancer or other major life challenges. Please let others know about the Objects page. It can be a source of support to people around the world. iMonty Monty, to assemble them into the first sculpture. Monty designed, constructed, and named Life's Voyage. Monty's genius is taking familiar objects, deconstructing them, then reconstructing them into art. 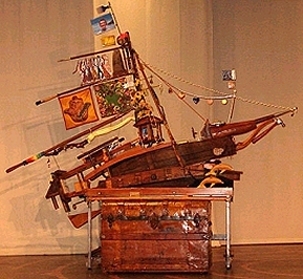 Capturing the feeling of an old-time sailing vessel, and adding his signature blend of meaning and whimsy, Monty created the basic structure of Life's Voyage from found objects in his collection: vintage chest, wine barrel slats, artist's stool, vintage wooden leg, child safety gate, broken chairs, wood tray, and coffee bean grinder. Then he added the 70 meaningful objects given by other people. Life's Voyage is captivating. Seven feet tall and nine feet long, it gives the impression of gliding gracefully and purposefully through rolling seas. It even has dolphins leaping from the waves alongside the bow. More colorful and detailed than this photo shows, every inch of the sculpture has something intriguing to see. Life's Voyage is available for exhibit or purchase. 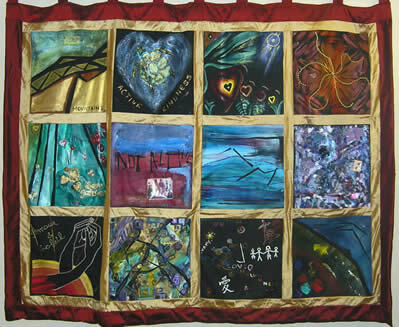 The second sculpture is a beautiful mixed media wall quilt. Created by individuals and families coping with cancer, the squares are cloth with acrylic paint, embroidery, and three-dimensional items that carry special meaning. It currently is on exhibit but is available for future exhibit sites. Paula Strothers and Martia Nelson orchestrated the creation of the quilt. To email your friends a link to this website, click here. And feel free to email us with your comments.